Because of the aluminum particles found in the foam, this roofing material makes for a great insulator and reflector, classifying it as a green roof. 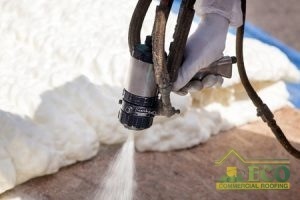 Even though the foam may seem thin, it does an excellent job of keeping a building cool in the summer and warm in the winter thanks to its great insulation. Foam roofs are one of the only roofing types that can be installed on top of already existing roofs. This helps eliminate landfill waste of old roofs and saves property owners time and money by not having to get additional roof removal before getting the foam installation. Since foam is seamless, it can adhere to any shape roof, so it is great for flat or sloped roofs. When dry, the foam creates a seamless layer, preventing any water from leaking through your roof. The foam can withstand high winds and rain, won’t break from hail, and even tolerate chemicals. Foam roofing can last as long as shingle roofs, up to 20 years. A bonus of foam roofs is when it comes time for a recoat, another layer can be added on top, saving replacement fees. With shingles replacement, the old roof has to be removed before new shingles can be put on, raising the labor price dramatically. If you are interested in getting foam roofing in Texas, Louisiana, and Mississippi, TX, call ECO Commercial Roofing at (833) 200-0571 today! Posted in Uncategorized on July 5, 2018 at 4:31 pm by ECO Roofing.